Featuring innovative Eco-Drive technology, this stylish men's watch from Citizen is a perfect balance of style and function. Featuring a stylish black chronograph dial complete with date box, this sleek watch is finished with a stainless steel bracelet strap. Distinctive design for everyday timekeeping. 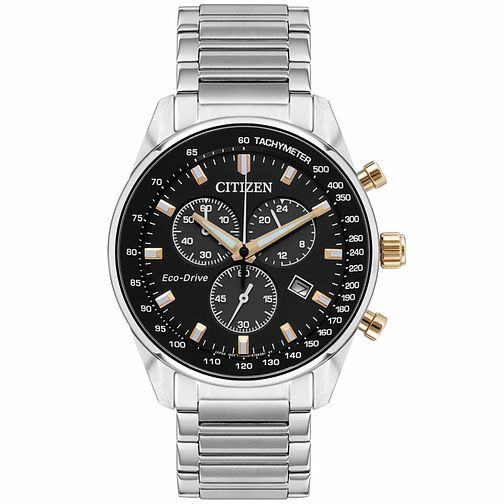 Citizen Eco-Drive Men's Stainless Steel Black Dial Watch is rated 4.9 out of 5 by 52. Rated 5 out of 5 by Anonymous from Dreams CAN come true! For years I have longingly gazed in shop windows and at duty free shops in airports dreaming of owning a Citizen watch! - However, other financial priorities and prices have prevented me from actually owning one ...until now! I took the plunge and took advantage of Samuel's on-line offer and NOW... all of my dreams have come true! Such a stylish and 'professional' time piece … the service was excellent and I'm delighted to have my very own Citizen watch! Rated 5 out of 5 by Anonymous from Smart and affordable! Excellent quality watch at a reaaonable price. Brought this for my upcoming wedding and couldnt be happier. Speedy checkout, faat delivery and came well packaged. H Samuel at its best!